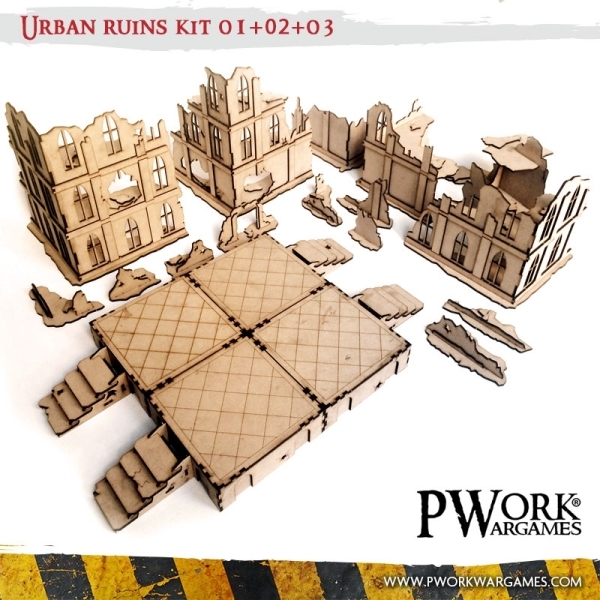 Home Gaming News MDF Scenery – Urban Ruins! Pwork Wargames MDF terrains! MDF Scenery – Urban Ruins! Pwork Wargames MDF terrains! MDF Scenery – Urban Ruins 3D terrains! MDF Scenery – Urban Ruins is a new line of 3D scenery terrain sets consisting in some different scenic elements made in MDF material, ideal for fantasy, historical or science-fiction settings; three Urban Ruins kits are available, each one including ruined buildings and remains of a collapsed walls. Each kit is composed by a different number of 3D scenic elements, from 4 to 12 terrain elements. Check also the kits bundles, to have more kits with a little discount! With MDF Scenery – Urban Ruins you can make your battles more realistic and more engaging! You can set on your mat awesome fights among a city in ruins!